Telling fortunes is easy, no? There are so many rich fortune tellers. Yeah, right, in your dreams. Sanderson plays Madame Fortuna to earn a few bucks. But it’s not always easy money. Find out how it can go wrong in chapter 2 of Nightfeater: Ghosts, entitled “The difficulties of running an honest scam.” And stick around, because the next installment of my Christmas ghost story goes up tomorrow. Does Sanderson see herself as the High Priestess? Sanderson uses a Rider-Waite, or as she calls it, Waite-Smith Tarot deck. It’s the tarot deck most commonly seen in the U.S. and U.K.; I’ve posted a sample card on the left. 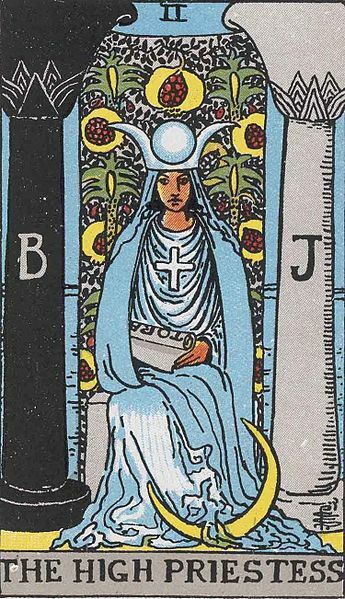 Noted occultist A. E. Waite (1857 – 1942) commissioned the deck according to his own ideas, which varies somewhat from traditional tarot decks in continental Europe. They were actually drawn by Pamela Colman Smith (1878 – 1951), which explains the name Sanderson uses. “Rider?” That was the name of the publishing company: William Rider & Son of London. Americans are used to seeing tarot cards used in fortune telling. We use a 52-card deck, sometimes with jokers, to play most of our card games. So it might be a surprise to know that tarot decks probably began as game-playing decks, and are still used that way in some European countries and their cultural offshoots. Sanderson herself doesn’t know this, and her tarot deck solitaire game is her own invention, not related to the traditional games using the deck. This entry was posted in History, Nightfeather, Writing fiction and tagged Fiction, ghost story, Pamela Colman Smith, supernatural, Tarot, Writing. Bookmark the permalink.